punchline, but I highly recommend checking out the full paper because it's absolutely beautiful work. You might remember from my previous post about controlling the brain with lasers that our lab studies a circuit called the basal ganglia, a neural network important for many different motor functions. Talia's experiments focus on one particular region within the basal ganglia: the striatum. Using a technique called patch-clamp electrophysiology, we can record from single neurons in live brain slices and measures the strength of the neuronal connections. These connections, or synapses, can change under different conditions -- a property known as synaptic plasticity (learn more about that here). Plasticity is a big deal in neuroscience because it's thought to be the biological substrate for learning and memory. This includes control of motor behavior by the basal ganglia, and problems with plasticity are implicated in numerous movement disorders. Dopamine is critical for plasticity in the striatum, specifically long-term depression (LTD) in the part of the circuit that inhibits movement. When dopamine is lost in a mouse version of Parkinson's disease, LTD is also lost. And restoring LTD reverses the movement deficits. (This was discovered by my advisor, Anatol Kreitzer, before he became a professor.) But until now, no one knew exactly how dopamine controls LTD.
Talia found that the missing link is a protein called regulator of G-protein signaling 4 (RGS4). 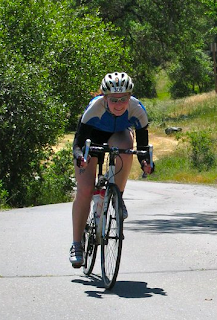 Actually, more than that, she dissected the entire molecular pathway connecting dopamine signaling to LTD. But the most exciting part is RGS4. Here's how it works (see diagram below): RGS4 blocks LTD. 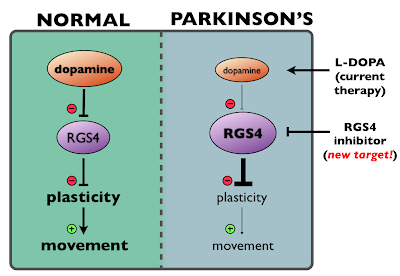 Under normal conditions, RGS4 is kept in check by dopamine, so LTD is able to occur. But when dopamine is lost in Parkinson's, that check disappears and RGS4 can act unhindered, preventing any LTD from occurring. And, as we already knew, that is bad news for movement. These results suggest that by manipulating RGS4, it's possible to alter plasticity in a way that bypasses dopamine altogether. In the final section of Talia's paper, she tests this hypothesis by using mutant mice that lack RGS4. Amazingly, these mice are protected from Parkinsonian motor deficits. This could be big news for human Parkinson's patients. The most common treatment, L-DOPA, relies on dopamine signaling and is far from perfect. Many people experience unpleasant side effects, and eventually it stops working entirely. So having an additional therapy, such as an RGS4 inhibitor, that is independent of dopamine could be extremely beneficial. Two issues to keep in mind, however. First, the mouse model of Parkinson's is very different from the human disease, and therefore it's difficult to say how applicable this strategy could be in treating actual patients. Second, this only deals with the symptoms. It doesn't stop the underlying neurodegeneration. Nevertheless, the possibility of a better way to alleviate the devastating symptoms of Parkinson's is welcome news. These results are very promising and I can't wait to see where Talia's findings might lead. Talia N. Lerner & Anatol C. Kreitzer (2012). 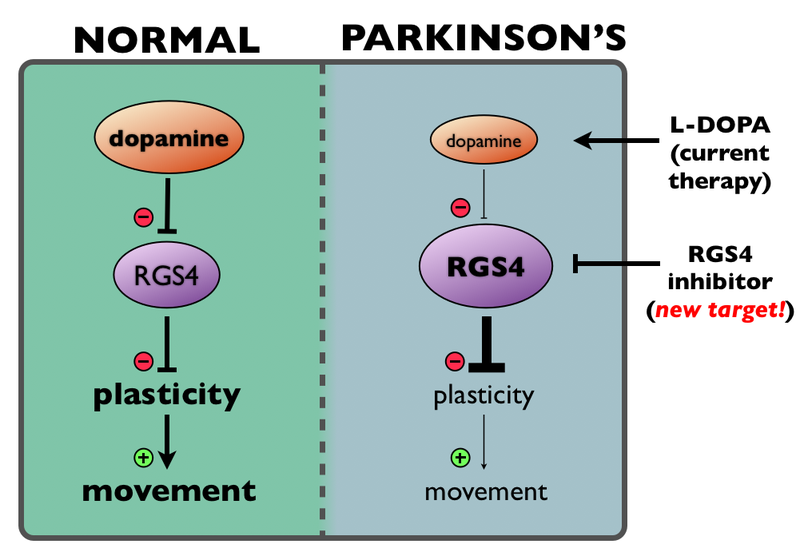 RGS4 is required for dopaminergic control of striatal LTD and susceptibility to Parkinsonian motor deficits. Neuron 73(2): 347-359.